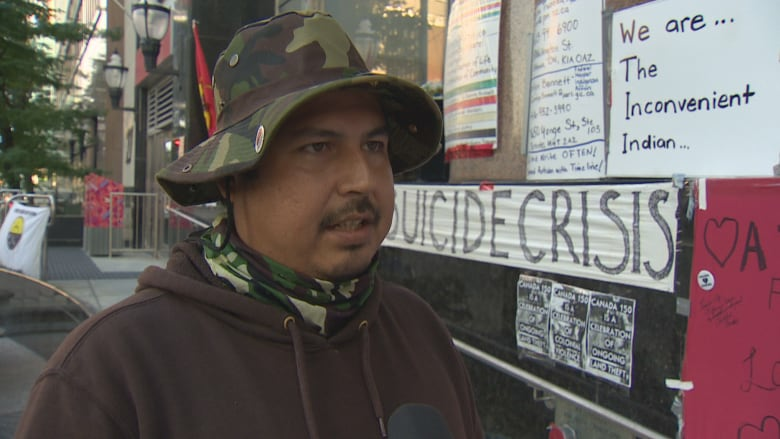 The Mississauga First Nation's Geoffrey Daybutch is taking part in a vigil outside the Toronto office of Indigenous and Northern Affairs Canada. Daybutch has been camping in downtown Toronto for more than 15 days. He says the group is gaining support from passers-by as they try to raise awareness about the high rates of Indigenous youth suicide. "It's an eye opener for the residents in the area as well who were never made aware of the conditions in First Nation communities in the remote parts of the country," Daybutch said. "We're here informing the general public who are passing by of these issues." Daybutch said the vigil will stand until some positive action to address the suicides is taken by the government. "It's really not up to me to decide when it's going to be torn down, and I really don't know how long it could take," Daybutch said. "They want to stay as long as it takes to see action, not just more promises of help will come, help will come."